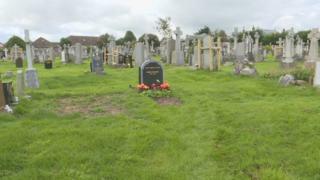 Two sisters have told how their mother was buried under an access path for hearses and lawnmowers at an Edinburgh cemetery. Rose Walker, 86, died on 2 January 2013, with her dying wish to be buried in the Mount Vernon Catholic cemetery. The church said the cemetery was full but the superintendent at the time, William Henderson, said there were still plots remaining. Henderson, 46, has been convicted of illegally selling burial plots. He pleaded guilty to one charge of fraud relating to his time at the Mount Vernon cemetery between 2006 and 2015. Frances Corbett and her sister Dot Fraser had paid £650 to Henderson, who asked for the money in cash. They were unaware anything was wrong until they were contacted by police. Mrs Corbett told BBC Scotland, said: "Mr Henderson said there was a grave there but it was only a double lair, most graves have four layers but because it was on bedrock it was just a two-layered grave. "We were only looking for a grave for our mum and dad so it wasn't an issue for us, so we were quite happy to have a double lair. "We were really thrilled to find out we were going to get a grave after being told we weren't going to get one." She said the family was unaware anything was wrong until the police got in touch and they discovered there were no records for the pensioner's grave. "She has been buried on a roadway for the lawnmowers to get up and down to cut the grass - and it was an access road for hearses - and she has been buried in the middle of that," Mrs Corbett said. The sisters spent months worrying that they may have to move their mother to another cemetery and that their 96-year-old father, who is still alive, would not be able to be buried next to her. They said they were very relieved when they were told their mother's body could remain in the cemetery. Mrs Fraser said: "He's taken people at their lowest point and he's taken advantage of them. "He's seen them as pound signs, as a way to make money and he's done it again and again. "We feel a lot of anger and our sister, Jackie, is completely devastated as she feels so guilty because she arranged it." Mrs Corbett said Henderson was "very nice" when she met him. "He was a very nice guy, very amiable and very helpful," she said. "His wife is lovely, his family is lovely so you would never expect this of him. "Now we know he has no morals whatsoever." They said their mother was a "tiny woman" at only 4ft 8in who was very fiery, very loving and had a great sense of humour.